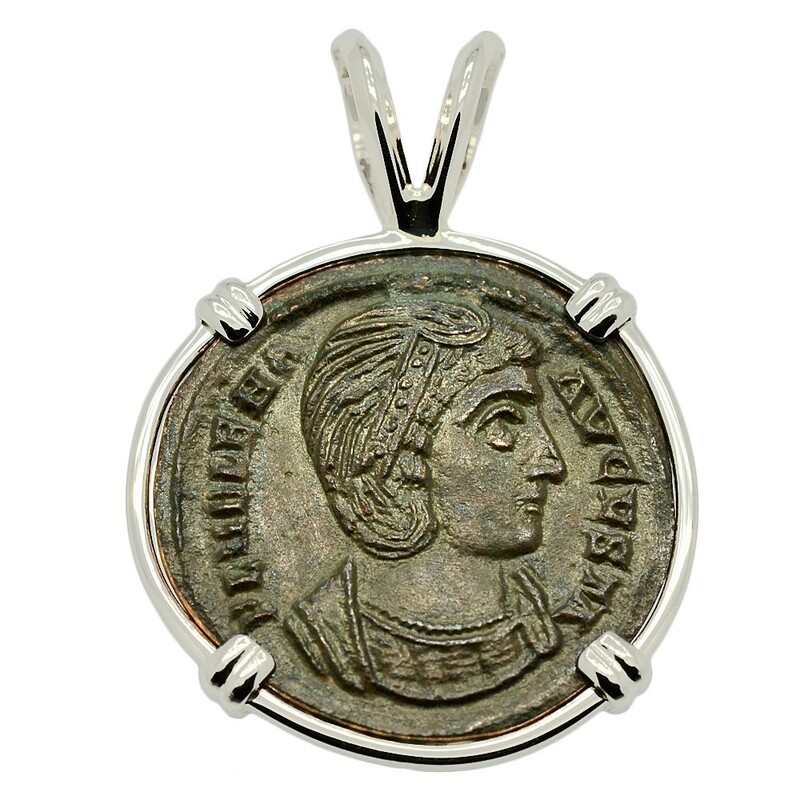 This coin was minted during the rule of Constantine the Great in the city of Siscia, which is located in modern day Croatia. 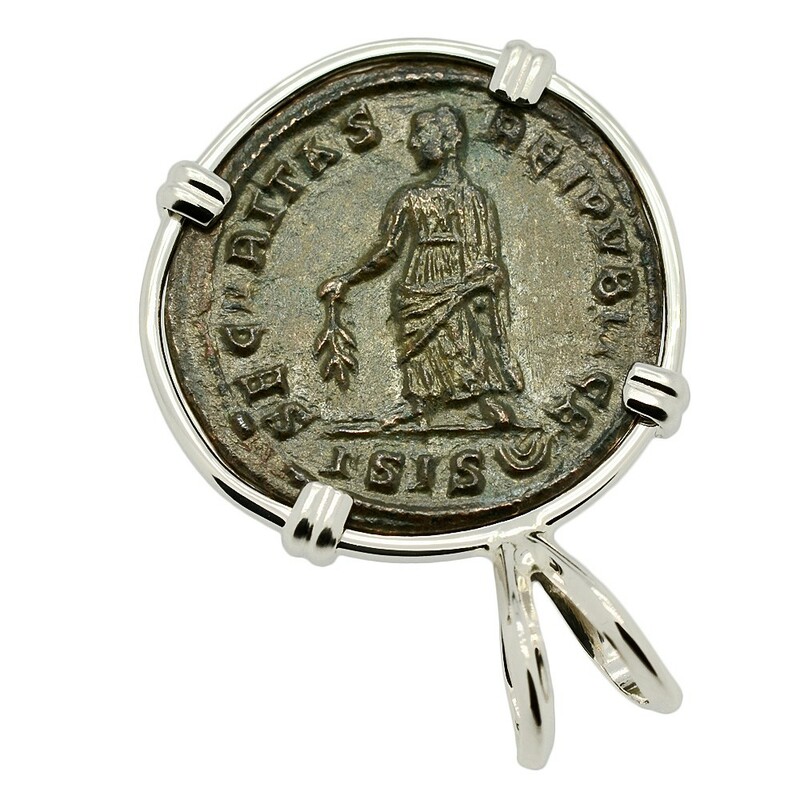 His mother Saint Helena is shown on the obverse side and Securitas, the Roman goddess of security and stability is shown on the reverse holding an olive branch. Helena was from the Greek city of Drepana in Asia Minor. She became the wife of the future Roman Emperor Constantius and gave birth to Constantine I in AD 272. Constantine became Emperor in 312 after the fateful victory at Milvian Bridge and Helena was named Empress. She had converted to Christianity and was a major influence on her son. In 313, Constantine announced toleration of Christianity in the Edict of Milan. This removed penalties for professing Christianity and returned confiscated Church property. 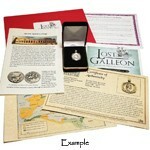 Constantine gave Helena unlimited access to the imperial treasury in order to locate Christian relics. In 326, Helena undertook a trip to the Holy Land. There she discovered the True Cross and was responsible for the construction the Church of the Nativity, Bethlehem and the Church of Eleona on the Mount of Olives, sites of Christ's birth and ascension. 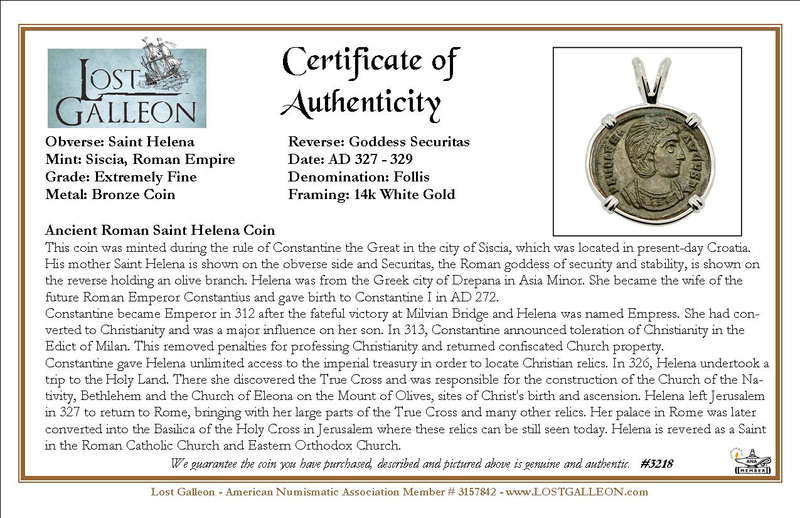 Helena left Jerusalem in 327 to return to Rome, bringing with her large parts of the True Cross and many other relics. Her palace in Rome was later converted into the Basilica of the Holy Cross in Jerusalem where these relics can be still seen today. Helena is revered as a Saint in the Roman Catholic Church and Eastern Orthodox Church.